Q: Why is there a charge on my order for the Food Topper? A: The bonus Food Topper is at no extra charge for the product but there is a charge of $6.95 to cover processing and handling. Q: Why is it $10 to Deluxe my Crank Chop? A: The upgraded Crank Chop is made with Japanese blades that will last longer and are more durable. The warranty is upgraded from 10 years to 15 years. 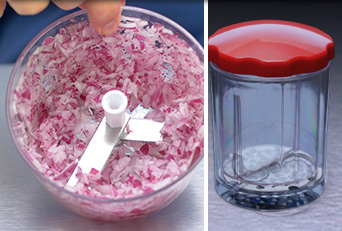 You will also receive an extra slicing blade to put into the Food Topper for slicing. Q: How many parts is the Crank Chop? 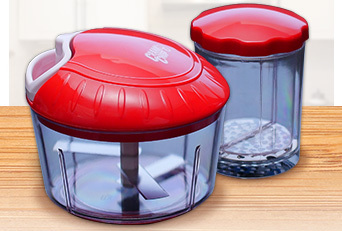 A: There are 3 parts: The top lid that includes the crank, the cutting rotary blades and the clear plastic base. Q: Will all the parts be dishwasher safe? A: The rotary blades and clear plastic base are dishwasher safe on the top shelf. The top lid that includes the crank is not dishwasher safe. Just hand rinse with water and wipe with a cloth or sponge. Q: Do I get my money back if I don't like it? A: Yes there's a 30 day money back guarantee, minus the shipping and handling. A: The crank pull spins base that the 3 blades are mounted on inside the base. Giving you about 24 cuts per crank pull. Q: Will this offer be in stores? A: This offer is not available in stores and it's a special limited time offer so act now is our recommendation. Q: Can I use it on any type of food? A: If you can cut it with a regular knife you can cut it with Crank Chop. Just make sure to not fill up the base to the top. It should be about half full before you pull the crank. If you need more, pour out the chopped food and repeat the process. Q: When will I receive the product? A: Due to high demand, you should receive the product in about 2 to 3 weeks. There is a rush delivery option of $10 which can get it to you sooner, approximately 5 to 7 business days.